Car Accidents happen far to often and this ad sends a very realistic message. the man is has been smashed into bus and is right into the windshield. 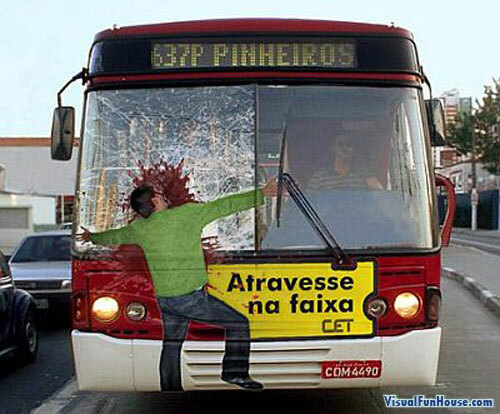 This add is fairly graphic and a bit morbid with the blood splattered on the windshield, but in the end it dose send a very clear message about accidents. A vehicle that size would destroy anything in its path, so play nice around buses and no running in the roads! Check out some other automotive optical illusions. bet this spread the message of not to cross the road without looking!